Previously, on MinerBumping... 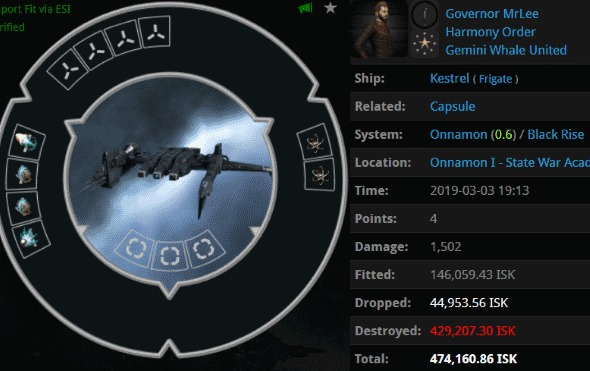 Almost immediately after Harmony Order corporation joined Gemini Whale United alliance, they began to regret it. The possibility of a war with the mighty CODE. alliance forced Harmony Order to open diplomatic channels. Yet this was not enough to prevent war. 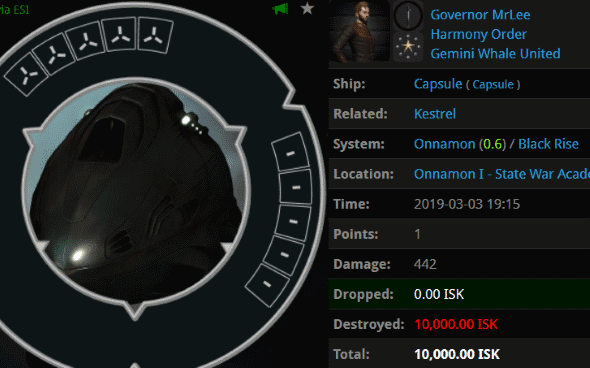 Although our Agents were able to sell some mining permits to Harmony Order, the isk they received was not enough to bring Harmony Order up to a sufficient level of Code-compliance. War was the only option. In less than 24 hours, war would begin--and bring all of its horrors with it. 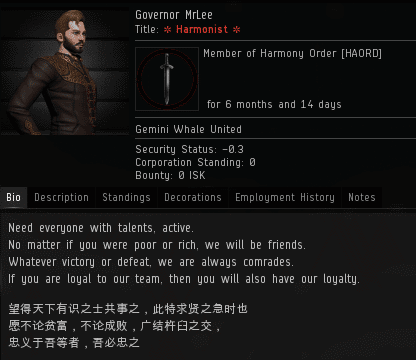 During this critical period, Harmony Order CEO Governor MrLee remained silent. As ever, he was utterly inscrutable. Then, at the last moment, Agent Viirilithizu Ward spotted him. But the CEO did not answer. Moa time. Viirilithizu ganked Governor's Kestrel. The Harmony Order leader was totally unprepared. The war hadn't started yet, but our Agents are more than capable of shooting Code violators at any time. Would this qualify as a "headshot"? It was a target of opportunity. And no one takes better advantage of opportunities in EVE than the Agents of the New Order. 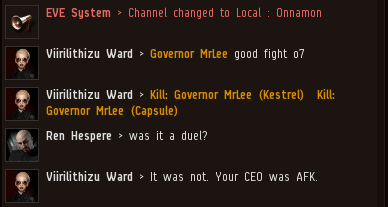 Now, with Harmony Order's CEO suffering a humiliating defeat before the war even began, would anyone be willing to fight CODE.? When the wardec went active, everyone in Harmony Order quickly scurried into their holes. Well, almost everyone. King Kong Moose openly announced his intention to fight CODE.--alone, if necessary. It's true that CODE. only fights when we know we'll win. To be fair, though, we always win, and we always know it. Always! King Kong Moose was brash and boisterous. Yet Viirilithizu became intrigued by this unruly member of Harmony Order who refused to obey his own corp's policy about not talking to CODE. Without the Code, however, pride can only precede a fall. Previously, our Agents set up some secure containers near Harmony Order HQ to remind them of the Code's power and authority. To the rebels who lived in the area, those containers became a symbol of oppression. 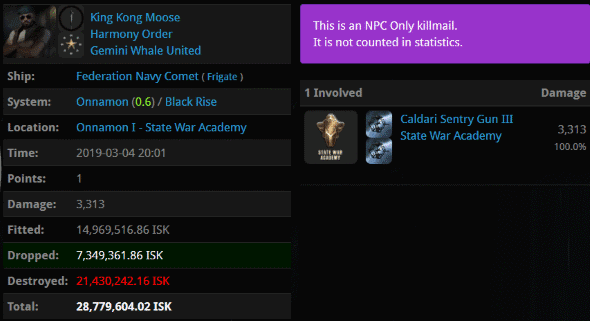 Defiant, King Kong Moose suicided a frigate in an unsuccessful attempt to destroy the containers. Viirilithizu was astonished by the deed. But the madness of war had only begun to take its toll. King Kong Moose, already showing signs of a gallant. Yes, this King Kong Moose is definitely the brightest star in Harmony's ranks! At least he shot at something! Governer Lee is most likely Taiwanese. He is using an ancient style of chinese writing. The silent treatment is also favored by inane schoolgirls. As opposed to chode. slaves, who like Jamey can't stop their inane ramblings about their supposed self-importance. When all the while they mean practically nothing to the vast, vast majority of EO denizens. I'm no slave. I discovered freedom during my baptism by CONCORD. That chip on your shoulder is as heavy as any slave chain. You too will be liberated when you discern that spaceships are meant to be blown up. Yes you are a slave, "Professor". A slave to Jamey's rhetoric and his ultimately destructive "vision" for EO. You are nothing more that a sheeple, blindly following his instructions. The word you're looking for is disciple, follower, or perhaps partisan. It's really quite incredible to claim that all of the Saviour's followers are slaves. That means you believe James 315 is so lofty that He can subjugate and dominate His followers remotely through a text-only medium. You should study Occam's razor. The Saviour is only a man. The difference between us is that we seek to humanize our opponents; you seek to dehumanize. Describing the Savior such a mundane way troubles my sensitive soul, even if it happens for purely educational reasons. There is not a single evidence that James 315 can't enthrall any miner into a submissive ganking-machine under five minutes in a Bonus Room. Therefore I'm convinced that the only thing stopping Him from doing so is His gentle nature that respects the free will of not just his citizens, but even the lowly miners. "I do not consider myself a hero, but I acknowledge that I have done many great and heroic deeds, and I accept that others think that I am a hero." While the Saviour takes great pride in His renowned humility, there is no harm in venerating Him. Well done to King Kong Moose, for actually shooting something other than an asteroid or mission NPC. It was fruitless, of course, as all highsec endeavours tend to be without The Code. Still, a pleasant surprise nonetheless. "Don't care smelly" is such a hilarious reply to an information that could save a ship from destruction and a miner from humiliation. I don't get why they aren't cheering for a series of such educational exercises.